Fellow weather geeks that have followed the models have seen the trend. The poll at the right reflects the shift to a track farther west. Is all lost? The arctic air has not truly built in here, and the tropical feed into this system will have dramatic warming on the east side. Again, for simplicity, I have been comparing just one model - the GFS - all week to show how elements can change. This also proves my point from earlier this week with that ridiculous snowcast on Tuesday. There are so many models to look at and decipher, many layers of the atmosphere, and text extractions (that won't look pretty here). If I showed it all I would run out of room on this blog- and bore half of you out of here. So let's stick with the basics and continue with the GFS which in fact I think is doing the best job. If you want to discuss other models, you can shoot me an e-mail. I'll try to get back with all of you (but it is the weekend). Here you can see the primary Low still dominant Sunday morning, and slower development of the secondary low. That second low is too close to us, and not off of the coast- which allows the warm flow to dominate. Some areas will get hammered! 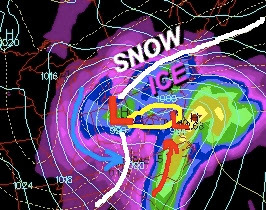 North/Central PA through central New England will get a major ICE STORM. This may include parts of central MD- but warm air will scream in here Sunday morning. The 'vertical velocities' and tropical support from Olga will produce heavy rain rates and likely thunderstorms... especially for the Eastern Shore. Where the cold air holds longer, moderate icing of 1/2" or more is possible. I think that will be confined west of us. Low dewpoints will allow for evaporational cooling. The initial precipitation evaporates and drops the temperature to the Wet Bulb level. So when it starts, it will get cooler. At noon BWI was 35F with a dewpoint temp of 19F. That gives a wet bulb near 26F. I don't see us dropping that low, but it should go back below freezing when 'stuff' begins between 4pm and 7pm. NE winds will lock in that cold air longer farther west and in valleys. While I have a general forecast map, elevation will play a role in ice- in this case, lower levels get more as warm air reaches hill tops first. Sunday morning potential for temperatures near 50F with heavy rain in the cities. The may be a sharp boundary with the cold air's last stand. Depending on the actual time and position of 2nd Low, will determine when the wind shifts and cold air filters back in. 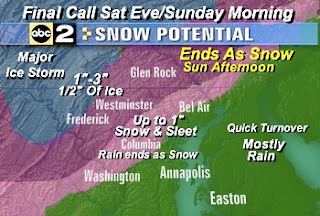 Sunday afternoon: A brief period of snow may be enough to coat the ground, or an inch or so. It's the quick drop in temps that would cause a quick freeze of anything wet. 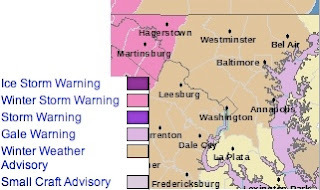 bummer on the weather... just saw on TV where I-95 corridor is going to miss out on all the "fun"... (sigh) oh well.... when is the next potential opportunity for some SNOW!?? !